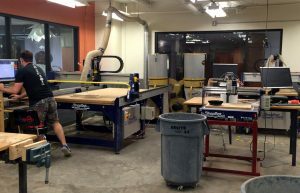 TechShop DC/Arlington served as a great host location for the first ever DC-Arlington Camp ShopBot. Situated across from Reagan International Airport, a large and varied population utilizes the space and tools. And with three different models of ShopBot machines and array of other machines their members are not lacking in digital fabrication resources. One can tell that Gadsden Merrill, General Manager, and his staff work tirelessly creating an energetic environment. The ShopBot team comprised of Sallye Coyle, Reggie Riddit, Thea Eck, Bill Young, and guest presenter Andy Pitts. Attendees drove in from as far away as Eastern PA and also from Baltimore and the surrounding Virginia communities. 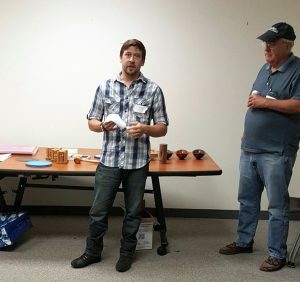 Experience ranged from absolute beginner to professional user with years of CNC practice, many types of material cut, and multiple Camps attended. And being at a makerspace, curious TechShop members popped in and out all day. 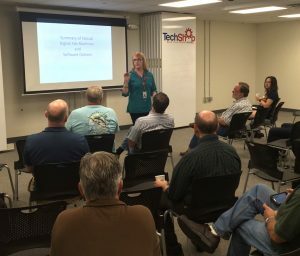 Sallye began the day discussing CNC and CAD/CAM along with the cache of digital fabrication tools now available to the average maker that aid in prototyping or embellishing projects. 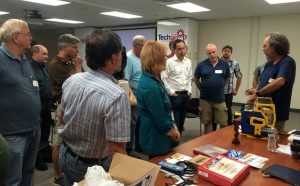 Thea then lead the group in several presentations including highlights of Vectric’s new Aspire 8.5 and how to calculate the dreaded feed rate and speeds for a project. Sallye showed some hidden gems in the SB3 software, which are often overlooked or not fully understood. Lunch gave everyone the opportunity to mingle, look around TechShop’s studios and talk one on one to ShopBot staff. Following lunch, the Show and Tell session offered a few volunteers the chance to present their projects. Andy Pitts then launched into the afternoon presentations explaining how to set up a CAD file and then machine a two-sided bowl using Aspire software. Though simple upon first inspection, this complex bowl shape utilizes multiple two-rail sweeps and 45° 3D machining techniques. Sallye and Thea followed up with two presentations on 3D machining: 3D scan to 3D machining and practices in 3D designing/machining starting with the basics such types of bits and understanding stepover rates. Bill Young discussed and then demoed FabMo, a new development currently used to operate the Handibot. 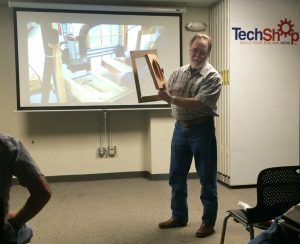 Bill chimed in throughout the day with his expertise on a variety of material, software, and machining topics. The final presentation, machine maintenance and troubleshooting, got everyone out of their seats and crowded around TechShop’s PRS Alpha 4×8. Like many Camps, the day sped by. Often times conversation came back to pricing items and calculating costs: electrical costs, material costs, production vs. custom items, how much to pay oneself and working with clients. Everyone seemed to gain new insight, some ‘hidden gem’, personal to them that will hopefully make machining or designing a little easier. Thank you to the TechShop DC/Arlington staff and to the attendees for spending their Saturday with us. The Wood shop. Each studio includes an array of tools, both traditional and digital. Andy Pitts explained the jig he used to register his two-sided bowl. Bill Young showed off the Handibot. Tim Clifton from Dorfman Museum Figures talked about a model hand cut from foam.